Boeing and ANA held a party in Washington today to celebrate the first 787 Dreamliner that is being delivered. The event was mostly to show off the new livery rather than to actually deliver the aircraft, so not an enormously important event. Still, it was good to see the plane painted and ready to go. That it looks more like SkyTeam at the back than ANA, but sure, why not. Nothing quite like having the local competitor featured in the headline photo. That’s quality stock image work there, folks. Anyways, the plane is now expected to be delivered at some point next month and to operate on short and medium-haul routes. Agreed, Matthew. The curves on the back scream SkyTeam to me. 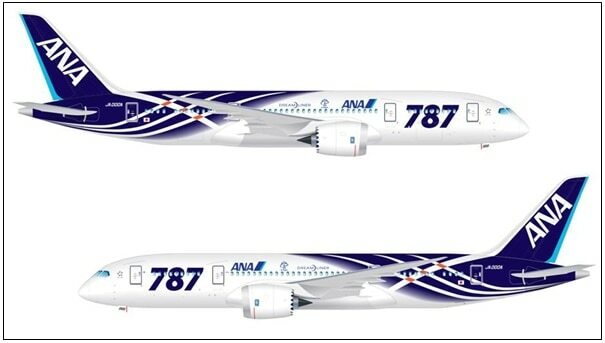 I think ANA’s stated that the first 787s will be used on Tokyo-Hong Kong routes. Any idea when the roll-out to Japan-U.S. routes will be? My understanding, Brad, is that the JAA has not yet certified the aircraft for ETOPS flights. Unlike the FAA that is wiling to accept many of the Boeing test flights for their certification data the JAA is requiring actual production operations. This means that it will be a while before the aircraft has worked up enough in-flight hours to be certified for the TPAC routes. It would also be quite surprising to me if tey operate on HKG with some regularity. The loads on those flights are generally pretty high. Then again, if they are using their “domestic” config for those flights maybe it isn’t quite so surprising. I’m sure yields are rough on those flights with all the competition and frequencies they are offering.